The annual motorcycle rally to benefit Hospice and Palliative Care of St. Lawrence Valley will take place for its 19th consecutive year on Saturday July 14th! 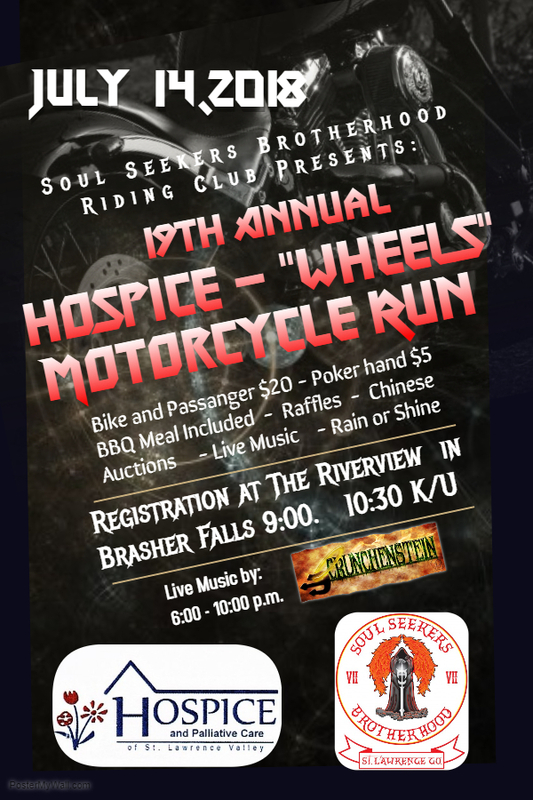 This year, the run is being organized by the Soul Seekers Brotherhood Riding Club (with plenty of support from their Sisterhood members as well). Many thanks to this group for taking over the efforts of organizing this event to ensure it’s continuation! The 100-mile run will kick off from the Riverview Bar & Restaurant in Brasher Falls. Registration begins at 9:00am, Kick Stands up at 10:30am. The cost is $20 (covers rider and a passenger). There will be a poker hand, raffle prizes, a BBQ dinner and live music from 6:00-10:00pm! All proceeds will benefit Hospice of St. Lawrence Valley and be used to help us continue to offer specialized end-of-life care and grief support to our neighbors in St. Lawrence County. Not a rider? – You can still join us for the BBQ dinner at the Riverview at the conclusion of the run for just $10! Many thanks to the Soul Seekers Brothers and Sisters for their hard work and to all the businesses who are supporting this event!